Happy End of Summer! It's going too fast, but I've had some time for activities, books, games and movies. I recommend Sister of My Heart by Chitra Banerjee Divakaruni, the story of two girls and their arranged marriages in India and their lives in the U.S. The book made me appreciate all the freedoms we have. I think everyone should see "My Big Fat Greek Wedding," a comedic look at the courtship of a young man with a Greek girl. It's based on the tale of Tom Hanks and his wife who are producers of the movie. Even though both partners are white, speak English and are Americans, the cultural differences are tremendous. I guarantee the film will make you both laugh and get a lump in your throat. I've started Mah Jongg and water aerobics, both of which I hope to continue when school begins August 12. Golf? Tennis? There's always next summer, I guess. 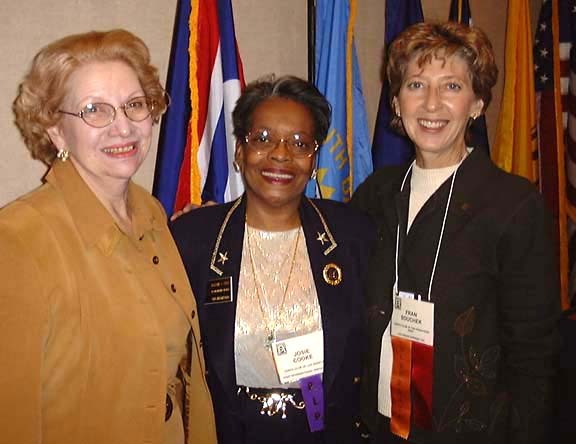 International President Margit Webjorn of Sweden announced in the latest Zontian that the theme for 2002-2004 is Advancing the Status of Women Worldwide. The three goals are Focus on Our Mission, Combine Service and Advocacy, and Recruit, Retain and Rejuvenate. Notice Mary Benoit's photo and Kate's name on page 20! I think our Club always operates with the best interests of women in mind. A few days ago, Janet and I had a fun time at the Olive Branch, and I learned that she and Shannon have great ideas for programs. Betty is meeting again with the New Member Committee of Helen, Patty, Janet, Karen, Mary Louise, Teri and Kate. They'll have a recommendation soon about the fashion show and possibly another club project! Pam had a memorable visit with a Zontian in St. Louis - I hope she'll tell us all about it! To celebrate summer, let's eat ice cream! The Intercept program needs journals, diaries, markers, stickers, colored pencils, gel pens, etc. They want each girl to start a journal. Buy some supplies for them and I'll see you on August 25 at Teri's house. I can't wait to see her lovely new home. Be sure to bring guests - hopefully they're all future Zontians. As you read this I'm in Ohio and Pennsylvania visiting my family. The summer goes too fast! Following is part of my report on the Poland Trip this last July. I am still working on the convention segment so that must come later. The trip to Poland and Sweden was fantastic and I wish each of you had been with us. Warsaw was flattened during World War II and much of it has been carefully restored. You may remember that after the German occupation, Russia took control of Poland until the late 1980's. June 21 - This day was not scheduled so several of us visited some areas of the city. As we were walking, we had a close-up view of the people and places. We went to the tallest building (30 floors) in Warsaw, the Palace of Culture and Science, which was a gift from Russia. It is not an honored gift and many of the Polish people said it was a gift they wanted to return but Russia declined to take it back. We saw the Jewish Synagogue with its graffiti and realized that anti-Semitism still exists in this country where approximately 1.5 million exterminations were carried out. It was reported that only a few thousand remain in Warsaw. We had a break at a sidewalk cafe, then on to Saskie Park where the tomb of the Unknown Soldier was. It was a beautiful park with children playing and others enjoying the beauty of the flowers and the day - especially us! As it had gotten quite warm, we took a cab back to near the hotel - a Marks & Spencer department store. This is a chain of stores that I had visited many times in England - interesting to see a store in Warsaw! There was Internet access at the hotel so I sent a few e-mails so didn't suffer too much computer withdrawal. That evening was the dinner where the Zonta Club of Warsaw welcomed us officially to their country and to the tour. There were approximately 70 of us that enjoyed sight-seeing and traveling together. We were often on a large bus. We had one day touring the Old Town, meeting with two women in the Parliament, and having lunch in the Parliament building. That evening was a wonderful dinner at the Biblioteka restaurant at the University Library where there were plants and grass on the top of the building. This was part of the University system and the library and other offices also existed in this building. At the dinner, several presentations were made to the Warsaw club including a southwestern pottery item from District 12. Sunday, June 23, found us at a piano concert in F. Chopin's birthplace. We sat outside in the garden on benches and seats while a pianist played inside and the music wafted out to our welcoming hearts. During the trip to Cracow, we stopped at a motel for lunch, then sight-seeing in Cracow and another fantastic meal at the hotel restaurant, meeting with the Zonta Club of Cracow. The next day found us touring around the old town, visiting the castle of Polish kings (Wawel), descending into the medieval salt mine (a real test of any feelings of claustrophobia) for a tour and a great lunch over 300 ft. down in a chamber that holds 150 people! Throughout the mine there were sculptures of all sizes created from salt and chambers where weddings and conferences are regularly held. The evening meal was held in a Jewish restaurant where music and singing were the highlights. Tuesday, June 25, was a travel day to the south of Poland with a raft trip down the Danajec river. We arrived at Zakopane and a stay at a mountain top chalet - more wonderful food and entertainment from a folk band. At this dinner, the attendees presented a large donation to the Zonta Club of Warsaw for their service projects in appreciation of the hard, extensive work required to make this visit such a success. On the 26th, we turned north on the road to Poznan. We stopped for a visit to the Auschwitz Concentration Camp Museum, which was very sobering, when one realized just what happened in this place. It made many of us very thankful that the allies were able to stop these activities and eventually to help bring freedom to many Europeans. We had lunch in the Bachelor Palace, which was a fantastic setting with gorgeous gardens and excellent food. It was very surprising that this facility was able to host all 70 of us with such wonderful service when we were two hours late! That night was spent at Poznan in a wonderful hotel on a lake. We all wished we had a couple of days to enjoy the setting but the next day we were off again to make our reservations on the ferry to Sweden. On the way out of Poznan, we stopped in the town square and saw the architecture of the buildings and visited many stalls selling various items. Upon arrival at the Baltic port of Swinoujscie, we wandered the seaside area and boarded the ferry about 8:00 pm. We had dinner at 10:00 pm and the ferry left port about 10:30. It was a beautiful evening and the seas were relatively calm. We had four to each very small cabin. I roamed the ferry several times during the night and young people were sleeping all over the floors, they appeared very content. We had breakfast at 7:00 and docked about 8:00. As our bus had come with us on the ferry, we boarded it again and the customs and immigration people in Ystad came on board the bus and processed us through. Then on to Gothenburg, where we arrived close to 3:00 pm., anxious to get involved with the convention. I may not be among you but you are always on my mind! Although I could not be at the last meeting, I was attending to Zonta business, I found myself in St. Louis to meet my first grandchild when our June meeting took place. I e-mailed Kris and she was kind enough to look in the directory send me an e-mail address for a Zontian in this area. Not just any Zontian, but the past president and incoming area 6 director, St. Charles, MO. Linda Jacobsen is president and CEO of Global Vision Strategies, her own international company, and very active in her local community in several women's groups. She exemplifies the kind of woman I have come to expect to meet in Zonta. She treated me to lunch at a wonderful restaurant "YiaYia's" not far from my son and daughter-in-law's apartment and we talked for 2 hours. What an enriching experience. I have asked her to put us in touch with other clubs with the idea of swapping newsletters either on-line or by paper copies. Sharing ideas can only benefit us all. Linda had a lot of exciting ideas to share, I took notes and hope to be able to present them to all of you. She will be at the international convention and will bring my flag pins to Eva there! She says she travels frequently and will come to Colorado Springs, and I hope she does. I can't wait to share some of her ideas with all of you. I don't think I will ever travel again without bringing my Zonta directory! What fun! Intercept Program: Please bring blank books-journals, pens, markers for the young women in this wonderful program. They will also accept checks for their program (payable to "WRA/Intercept"). Plan to attend the District Conference 2002 in Cheyenne, WY! As you all know I was scheduled to study in Pune, India for five months with the Associated Colleges of the Midwest this fall 2002. However, due to military and political tension in India the program has been cancelled. I hope to go to India in the fall of 2003. This fall I will be on the Colorado College campus. I hope to meet you and thank you in person for all of your support.